In the Egyptian city of Alexandria, one of the historic pillars of knowledge and culture, Dr. Foda serves as Professor & Head of Facial Plastic Surgery Division at Otolaryngology Department, Alexandria Medical School. As a facial plastic surgeon, Dr. Foda is internationally recognized as one of the most talented nasal plastic and reconstructive surgeons. For the past 20 years Dr. Foda's practice has been focused exclusively on rhinoplasty and his numerous technical innovations in that field brought him invitations to serve as an invited guest faculty at rhinoplasty meetings and courses all over the world; in Europe (Hamburg, Munich, Zurich, Milano, Sylt, Stuttgart, Strasburg, Mannheim, Porto, Karlsruhe, Bergamo, Monaco, Athens, Palma de Mallorca, Antalya, Bruges, London, Rome, Freiburg, Nice, Istanbul, Barcelona, Antwerp, Paris, Berlin, Coventry, Asturias, Cannes, Ankara, Amsterdam, Madrid), the Americas (New Orleans, Washington DC, Palm Desert, New York, Las Vegas, Seattle, Hollywood, Colombia, Brazil), as well as in Asia (Jordan, Kuwait, Dubai, Saudi Arabia, Iran, lebanon, Ukraine, India, South Korea). In most of these teaching courses Dr. Foda was invited to lecture and to operate live on difficult noses to demonstrate his new rhinoplasty techniques. Additionally, doctors from over 20 European and Arab Countries came to Alexandria to be trained on rhinoplasty by Dr. Foda. Since 1998, Dr. Foda has been organizing an annual rhinoplasty live-surgery course which accepts only 30 participants every year. Over the past 10 years the course earned a reputation as one of the best rhinoplasty teaching courses in the region and it's usually fully-booked a year in advance. Dr. Foda's rhinoplasty achievements and innovations have received extensive coverage by all forms of media both nationally and internationally, he also has been interviewed by the national TV and by the Showtime TV satellite network. In 2012, Dr. Foda started a Rhinoplasty Live Surgery Fellowship that runs twice a year. It is the only rhinoplasty fellowship, worldwide, that provides hands-on live surgical training. The large number of applicants made the fellowship pre-booked for 3 years in advance (Testimonials from previous fellows). Dr. Foda teamed-up with Alexander Berghaus (Germany) to co-direct the ECAMS Rhinoplasty Master Course. The Course was attended by doctors from many European and Asian Countries. It included a full day of lectures covering all aspects of Rhinoplasty and a full day of cadaver dissections was the participants were trained on all the Rhinoplasty techniques. Dr. Foda was the Guest Instructor at Jeddah 4th Rhinoplasty Course, where he gave 8 lectures covering most of the important aspects in Rhinoplasty. Dr. Foda also instructed the delegates on the most sophisticated Rhinoplasty techniques during the cadaver dissection sessions. The Course was elegantly organized by Dr. Ashraf AbdulJabbar and included a faculty of top Rhinoplasty surgeons in Saudi Arabia. Dr. Foda was one of 10 surgeons selected to operate live at the 1st Bergamo to Istanbul Rhinoplasty Live Surgery Meeting. Other surgeons included Gubisch (Germany), Robotti (Italy), Cerkes (Turkey), East (UK), Sykes (USA) Rowe-Jones (UK), Goksel (Turkey), and Davis (USA). It was one of the world biggest Rhinoplasty live surgery meetings. Dr. Foda gave a live surgical demonstration and delivered a keynote lecture on Revision Rhinoplasty. Dr. Foda was an invited guest speaker at the European Rhinoplasty Course. The Course Faculty included some top Rhinoplasty surgeons from Belgium, Italy, USA, Netherlands, Germany, Iran, and Greece. Dr. Foda delivered 6 lectures on different Rhinoplasty topics. Dr. Foda, and Dr. Kovacevic (Germany) co-directed the Rhinoplasty workshop organized by the ENT Department at Dubai Hospital. Dr. Foda gave a Septorhinoplasty live surgical demonstration and instructed the participants on the different rhinoplasty techniques during the cadaveric dissection session. Dr. Foda was an invited faculty at the Emirates 9th Otorhinolaryngology Congress. Dr. Foda and Dr. Kovacevic (Germany) and other eminent speakers from Saudi, Emirates, Lebanon, and Kuwait were the main speakers of the rhinoplasty sessions. Dr. Foda delivered 6 lectures on different rhinoplasty topics. Dr. Foda welcomed fellows from Germany, Poland, Saudi, and Hungary for his 13th live surgery fellowship which lasted for a whole week and included daily lectures and intensive hands-on surgical training on 12 rhinoplasty cases. Dr. Foda coached the fellows while performing the most sophisticated rhinoplasty maneuvers and techniques. Dr. Foda joined an esteemed group of invited International speakers from Germany, South Korea, USA, Italy, Saudi, and Canada at the 41st Kuwait Otolaryngology Conference. Dr. Foda gave multiple lectures on different Rhinoplasty topics and moderated panel discussions. Dr. Foda was invited to the 2nd Mansoura Rhinoplasty Workshop organized by the Otolaryngology Department at Mansoura University. Dr. Foda lectured on multiple Rhinoplasty topics and gave a live-surgical demonstration on a case of a severely crooked nose. Dr. Foda was an invited guest faculty at the 2nd International Meeting of Rhinoplasty Societies. The faculty included 40 of the world best Rhinoplasty experts who shared 3 full days of intense presentations of the latest advances in the field of Rhinoplasty. Dr. Foda gave multiple talks on different Rhinoplasty topics and shared in the Panel discussions. Dr. Foda was an invited guest faculty at the Rhinoplasty & Face meeting which was held at the Porto Business School. The meeting was elegantly organized by Lidia Guimaraes and included all the Portuguese top Rhinoplasty surgeons. Dr. Foda gave multiple talks on different Rhinoplasty topics and shared in the Panel discussions. Dr. Foda was an invited speaker at the 2nd ITA meeting which was held in Cairo. Dr. Foda gave 2 keynote lectures on the surgery of nasal dorsum and the nasal tip. The meeting was very well organized with a high attendance rate from doctors with diversified backgrounds; plastic surgeons, dermatologists, otolaryngologists, and maxillofacial surgeons. Dr. Foda was an invited by ENT department at Farwania Ministry of Health Hospital for a 3-day visit during which Dr. Foda examined patients and performed 3 rhinoplasty live surgical demonstrations. Dr. Foda also gave daily lectures covering different aspects of rhinoplasty. Dr. Foda teamed-up with Alexander Berghaus (Germany) in directing the 2nd ECAMS Rhinoplasty Master Course, with Dr. Alexander Berghaus. The Course was attended by doctors from many European and Asian Countries. It included a full day of lectures covering all aspects of Rhinoplasty and a full day of cadaver dissections were the participants were trained on all the Rhinoplasty techniques. Dr. Foda welcomed fellows from Swiss, Belgium, UK, and Spain for a One-week live surgery fellowship which included daily lectures and intensive hands-on surgical training on 12 rhinoplasty cases. Dr. Foda coached the fellows while performing the most sophisticated rhinoplasty maneuvers and techniques. Dr. Foda was an invited guest faculty at the 2nd RhinoRoma International Rhinoplasty Congress. The faculty included most of the eminent Italian Rhinoplasty surgeons and a few number of International Faculty. Dr. Foda gave multiple lectures on different Rhinoplasty topics and shared in the Panel discussions. Dr. Foda was an invited faculty at the 9th International congress of Jordanian Society of Otolaryngology. Dr. Foda and Dr. Sherris (USA) were the main speakers at the Rhinoplasty session along with some of the most eminent Jordanian rhinoplasty surgeons. Dr. Foda was an invited guest faculty at the 1st Bogota Hands-on Rhinoplasty Course. The guest faculty included Dr. Papel (USA), Dr. Morera (Spain), Dr. Patrocinio (Brazil), Dr. Desio (Argentina). Dr. Foda gave 5 lectures and shared in 3 Panel discussions and instructed the participants on the different rhinoplasty techniques during the cadaveric dissection sessions. Dr. Foda was the director of the Rhinoplasty Track at the 15th Annual meeting of the Middle East Academy of Otolaryngology. The International Faculty included Dr. Berghaus (Germany), Dr. Apaydin (Turkey), Dr. Yazbek (Lebanon), Dr. El Bestar (Egypt), Dr. Bizrah (KSA), and Dr. Al-Sebeih (Kuwait). The two full-day Rhinoplasty sessions included lectures, video presentations, and panel discussions that covered most aspects of the Rhinoplasty procedure. Dr. Foda was an invited guest faculty at the 6th Bergamo Open Rhinoplasty Course. Dr. Foda gave a one-hour masterclass on revision Rhinoplasty, in addition to multiple presentations and panel discussions. The course was perfectly organized by Enrico Robotti and with over 600 delegates coming from over 60 Countries, it has undisputedly become one of the most prestigious Rhinoplasty events in the world. Dr. Foda was an invited faculty at the RSE Annual Meeting in Bergamo where he participated in the presentations as well as in the Panel discussions. Dr. Foda was the Guest Instructor at Jeddah 3rd Rhinoplasty Course, where he gave 8 lectures covering most of the important aspects in Rhinoplasty. Dr. Foda also instructed the delegates on the most sophisticated Rhinoplasty techniques during the cadaver dissection sessions. The Course was elegantly organized by Dr. Ashraf AbdulJabbar and included a faculty of top Rhinoplasty surgeons in Saudi Arabia. Dr. Foda was the invited international guest faculty of the Global Rhinoplasty Update-2018 which was held in Jaipur, India. Dr. Foda gave two live surgery demonstrations as well as 3 lectures on different rhinoplasty topics. The workshop was elegantly organized by Dr. Sunil Tanwar and included eminent Indian rhinoplasty surgeons as Dr. Brajendra Baser and Dr. Virendra Ghaisas. Dr. Foda and Dr. Robotti (Italy) were the directors of the rhinoplasty workshop organized by the ENT Department at Dubai Hospital. Dr. Foda gave a Septorhinoplasty live surgery demonstration and instructed the participants on the different rhinoplasty techniques during the cadaveric dissection sessions. Dr. Foda was an invited faculty at the Emirates 8th Otorhinolaryngology Congress. Dr. Foda and Dr. Robotti (Italy) were the main speakers of the rhinoplasty sessions. Dr. Foda delivered 7 lectures on different rhinoplasty topics. Dr. Foda was the invited international guest faculty of the APKO workshop organized by the German Society of Otolaryngology. Dr. Foda gave 4 rhinoplasty lectures and shared in the panel discussions. The workshop was well attended by most of the German Otolaryngologists who are interested in Facial Plastic Surgery. Dr. Foda was the invited guest faculty of the Rhinoplasty workshop organized by the Ukrainian Society of Aesthetic Plastic Surgeons. Dr. Foda gave 3 rhinoplasty lectures and performed two live surgical demonstrations; one primary and one revision rhinoplasty. The workshop was professionally organized by Dr. Gennadiy Patlazhan. Dr. Foda welcomed fellows from France, Germany, UK, and Kuwait for a One-week live surgery fellowship which included daily lectures and intensive hands-on surgical training on 12 rhinoplasty cases. Dr. Foda coached the fellows while performing the most sophisticated rhinoplasty maneuvers and techniques. Dr. Foda was and invited faculty at the Face-Eyes-Nose Conference held at University Hospitals of Coventry and Warwickshire. Dr. Foda joined and elite international rhinoplasty faculty that included Drs. Toriumi (USA), Gassner (Germany), Palma (Italy), Gerbault (France), Mustoe (USA) and some of the most prominent British rhinoplasty surgeons. Dr. Foda delivered three lectures, shared in two panel discussions, and gave a cadaveric demonstration, together with Dr. Toriumi, on all the different tip modifying techniques. Dr. Foda was an invited guest faculty at the 1st Dammam University Rhinoplasty Course. Dr. Foda gave 8 lectures covering most aspects of rhinoplasty and codirected the cadaver dissection sessions with Dr. Rettinger (Germany) where the participants were trained on most of the rhinoplasty approaches and techniques. The course was very professionally organized by Dr. Mona Ashoor. Dr. Foda was an invited faculty at the Annual Conference of EAFPS which was held in Lisbon, Portugal. The conference included a huge faculty from all over the world. Dr. Foda shared in a number of panel discussions, round tables, and video panels. Dr. Foda was an invited faculty at the 1st Mansoura Rhinoplasty Workshop organized by the ENT Department of Mansoura Faculty of Medicine. Dr. Foda gave an External rhinoplasty live surgical demonstration as well as rhinoplasty lectures. The Workshop Faculty included eminent Rhinoplasty surgeons from Universities of Mansoura, Cairo, and Alexandria. Dr. Foda welcomed fellows from Belgium, Swiss, Spain, and Cypress for a one-week live surgery fellowship which included daily lectures and intensive hands-on surgical training on 8 primary and 4 revision rhinoplasties. Dr. Foda coached each of the fellows while performing the most delicate rhinoplasty maneuvers and techniques. Dr. Foda was an invited guest faculty at the 10th Newcastle Aesthetic & Functional Septorhinoplasty Course. The Course was elegantly by Dr. Reda and included some distinguished faculty from UK and Europe. Dr. Foda gave 6 lectures covering most aspects of Rhinoplasty and instructed the participants on the different rhinoplasty techniques during the cadaver dissection sessions. Dr. Foda was an invited faculty at the 2nd Nice Rhinoplasty Course organized by the Nice Faculty of Medicine. Dr. Foda gave an External rhinoplasty live surgical demonstration and Dr. Palma (Italy) demonstrated a closed rhinoplasty. Dr. Foda gave a Masterclass on Revision tip surgery beside 3 other rhinoplasty lectures and instructed the participants on different tip modifying techniques in the cadaveric dissection course. Dr. Foda was an invited faculty at the 11th Septorhinoplasty Course at Hospital De Cabuenes in Gijon, Asturias. The course was elegantly organized by Dr. Federico Arrutia and Miguel Mancebo and included a faculty of top rhinoplasty surgeons of Spain. Dr. Foda operated live on 2 cases and delivered 4 lectures and shared in 2 panel discussions. Dr. Foda was an invited speaker at the Sharm Derma international conference for dermatology and cosmetology. Dr. Foda lectured on Problems in revision rhinoplasty. Dr. Foda and Dr. Robotti (Italy) were the international guests of the Munich rhinoplasty course organized by ENT department of Ludwig-Maximilian-University. Dr. Foda gave two septorhinoplasty live surgical demonstration and delivered 8 lectures covering different aspects of rhinoplasty. Dr. Foda also instructed the participants on the different rhinoplasty techniques during the cadaveric dissection sessions. Dr. Foda, Dr. Calvert (USA), and Dr. Onerci (Turkey) were the directors of the Rhinoplasty workshop organized by the ENT Department at Dubai Hospital. Dr. Foda gave a Septorhinoplasty live surgical demonstration and instructed the participants on the different rhinoplasty techniques during the cadaveric dissection session. Dr Foda was an invited faculty at the Emirates 7th Otorhinolaryngology Congress. Dr. Foda and Dr. Calvert (USA) were the main speakers of the rhinoplasty sessions. Dr. Foda delivered 8 lectures on different rhinoplasty topics. Dr. Foda welcomed 4 visiting fellows from Pakistan, India, and Qatar for a one-week of live surgery fellowship which included daily lectures and intensive hands-on surgical training on 8 primary and 4 revision cases. Dr. Foda coached each of the fellows while performing the most delicate rhinoplasty maneuvers and techniques. Dr. Foda co-chaired the Rhinoplasty session with Dr. Taher Ismail at the 2nd International Congress of Aesthetic Academy of Egypt that was held at the Nile Ritz-Carton Hotel in Cairo. Dr. Foda gave a keynote lecture on nasal dorsum realignment. Dr. Foda was the coordinator of the rhinoplasty sessions at the 7th PARS conference in Bahrain. The rhinoplasty guest speakers included Charles East (UK), Fazil Apaydin (Turkey), David Roberts (UK), Tariq Saeed (Bahrain), Hesham Saleh (UK), and Amr Rabie (Egypt). Dr. Foda delivered 4 talks on different rhinoplasty topics and moderated a panel on revision rhinoplasty. Dr. Foda was an invited guest faculty at the 2nd Rinoarrabida Rhinoplasty Course in Porto. DR, Foda joined a faculty that included rhinoplasty experts from various Countries including Miriam Boenisch (Austria), Ozcan Cakmak (Turkey), Hesham Saleh (UK), as well as the top rhinoplasty surgeons of Portugal. The course was elegantly organized by Dr. Rui Xavier and well attended by participants from most European Countries. Dr. Foda gave 6 lectures covering different rhinoplasty topics and instructed the participants on different rhinoplasty techniques during the cadaveric dissection sessions. Dr Foda directed a 2-day rhinoplasty workshop at the NTI in Cairo. Instructors at the Course included Dr. Mahmoud Elbestar and Dr. Amr Rabie. The workshop included a full-day of lectures covering most aspects of rhinoplasty and a full-day of cadaveric dissection in which the participants were trained on different rhinoplasty approaches and techniques. Dr. Foda was selected to join a Faculty of 50 World best rhinoplasty surgeons nominated by the Rhinoplasty Society of US and the Rhinoplasty Society of Europe in their 1st combined meeting. The meeting provided by-far the highest educational level in Rhinoplasty and it is not likely to be matched in years to come. Dr. Foda was an invited guest faculty at the 5th Annual Meeting of RSE. The faculty included the board members of the RSE beside a group of pioneer rhinoplasty surgeons from the States as Bahman Guyuron, Rick Davis, Rollin Daniel, Rod Rohrich, Dean Toriumi, and Ron Gruber. Dr. Foda was invited by the ENT department at Farwania Ministry of Health Hospital for a 3-day visit during which Dr. Foda examined patients and performed 3 rhinoplasty live surgical demonstrations. Dr. Foda also gave daily lectures covering most aspects of rhinoplasty. Dr. Foda was selected as the Guest editor of the August issue of the FPS Journal which was titled “Challenging problems in Rhinoplasty”. Dr. Foda chose a group of authors composed of world-class rhinoplasty surgeons including; Rollin Daniel, Russell Kridel, Wolfgang Gubisch, Charles East, Richard Davis, Milos Kovacevic, Alexander Berghaus, Fazil Apaydin, and Peter Lohuis. Dr. Foda welcomed 4 visiting fellows from Sweden, Germany, and Dubai for a one-week of live surgery fellowship which included daily lectures and intensive hands-on surgical training on 7 primary and 5 revision cases. Dr. Foda coached each of the fellows while performing the most delicate rhinoplasty maneuvers and techniques. DR FODA DIRECTOR OF ANTWERP RHINOPLASTY COURSE IN BELGIUM. Dr. Foda and Dr. Berghaus (Germany) were the directors of the first Antwerp Rhinoplasty Course. Dr. Foda operated live on two cases; one primary and one revision septorhinoplasty. Also, Dr. Foda gave 8 lectures covering most aspects of rhinoplasty. DR FODA INVITED GUEST SPEAKER IN NICE, FRANCE. Dr. Foda, Dr. Robotti (Italy), and Dr. Jaklis (Lebanon) were the international guest speakers at the Nice Rhinoplasty Course organized by the Nice Faculty of Medicine. The Faculty included eminent French rhinoplasty surgeons from Nice, Paris, Lyon, and Bordeaux. Dr. Foda gave a Masterclass on Tip surgery beside 3 other rhinoplasty lectures and instructed the participants on different tip modifying techniques in the cadaveric dissection course. DR FODA INVITED GUEST SPEAKER IN COVENTRY, UK. Dr. Foda was an invited faculty at the Face-Eyes-Nose Conference held at University Hospitals Coventry and Warwickshire. Dr. Foda joined an elite Rhinoplasty faculty that included a mix of International and British Rhinoplasty Surgeons as Drs. Guyuron (USA), Gubisch (Germany), East (UK), Robotti (Italy), Patel (UK), Gerbault (France), and Braccini (France). Dr. Foda gave 4 Rhinoplasty presentation and instructed the participants on different tip suturing techniques in the cadaveric dissection course. DR FODA INVITED GUEST SPEAKER IN JORDAN. Dr. Foda was an invited guest speaker at the 1st annual meeting of the American College of Surgeons-Jordan Chapter which was held in Amman, Jordan. DR FODA INVITED SPEAKER AT DERMA SHARM 2016. Dr. Foda was and invited guest speaker at the international conference for dermatology and cosmetology “Derma Sharm 2016”. Dr. Foda delivered a keynote lecture on revision rhinoplasty. This year Dr. Foda was the invited international speaker at the annual meeting of the British society of rhinoplasty surgeons. The meeting was headed by the society president Dr. Patel and was attended by many doctors interested in the specialty. Dr. Foda delivered a keynote lecture on his career in rhinoplasty as well as a number of other talks on different rhinoplasty topics. Dr Foda Invited Speaker in Ankara, Turkey. Dr. Foda was an invited speaker at the 12th International Congress of Otolaryngology-Head Neck Surgery which was held in Ankara, Turkey. Dr. Foda delivered 5 talks on different rhinoplasty topics. Dr Foda Invited Speaker In Jeddah, Ksa. Dr. Foda was an invited faculty at the 2nd Jeddah Rhinoplasty Course organized by the ENT department at King Fahd Hospital. Dr. Foda gave 7 lectures covering different aspects of Rhinoplasty and instructed the participants on the different rhinoplasty techniques during the 2 cadaveric dissection sessions. Dr Foda Invited Speaker At Egyptian Society Of Plastic Surgeons. Dr. Foda was an invited faculty at the 46th Annual meeting of the Egyptian Society of Plastic & Reconstructive Surgeons. Dr. Foda co-chaired the rhinoplasty session in which he gave 2 lectures. Dr Foda Invited To Operate & Lecture In Munich, Germany. Dr. Foda was the international guest faculty of the Munich rhinoplasty course organized by ENT department of Ludwig-Maximilian-University. Dr. Foda gave a septorhinoplasty live surgical demonstration and delivered 10 lectures covering different aspects of rhinoplasty. Dr. Foda also instructed the participants on the different rhinoplasty techniques during the 2 cadaveric dissection sessions. Dr Foda Director Of Rhinoplasty Masterclass In Amsterdam, The Netherlands. Dr. Foda was a co-director, with Dr. Gubisch, of the rhinoplasty masterclass organized by European College of Aesthetic Medicine and Surgery (ECAMS) at Academic Medical Center in Amsterdam. The masterclass included one full-day of rhinoplasty lectures and another full-day of cadaver dissections where participants were instructed on most rhinoplasty techniques by Dr. Foda and Dr. Gubisch. Dr. Foda and Dr. East (UK) were the directors of the Rhinoplasty workshop organized by the ENT Department at Dubai Hospital. Dr. Foda gave a Septorhinoplasty live surgical demonstration and instructed the participants on the different rhinoplasty techniques during the cadaveric dissection session. Dr Foda was an invited faculty at the Emirates 6th Otorhinolaryngology Congress. 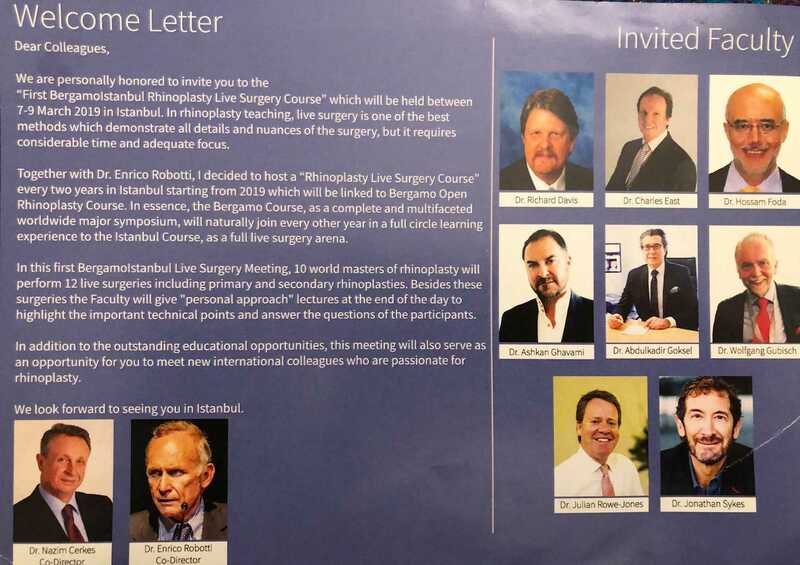 The rhinoplasty sessions included a group of internationally renowned speakers from UK, Turkey, Korea, Switzerland, USA, as well as all regional Countries. Dr. Foda delivered 4 talks on different rhinoplasty topics. Dr. Foda welcomed 4 visiting fellows from Germany, Poland, Bahrain, and Jordan for a one-week live surgery fellowship which included daily lectures and intensive hands-on rhinoplasty training on 12 rhinoplasty cases; 8 primary and 4 revision cases that were carefully selected to include most of the functional and cosmetic nasal deformities. Dr. Foda coached each of the fellows while performing the most delicate rhinoplasty maneuvers and techniques. Dr. Foda was an invited faculty at the 6th Pan Arab Rhinology Society meeting held in Riyadh, KSA. Dr. Foda gave 2 lectures on Tip surgery and Deviated noses as well as a 1-hour nasterclass on Revision rhinoplasty. Dr. Foda was and invited faculty at the 1st Kuwaiti Symposium on facial Plastic Surgery that was held at Salwa Sabah Al Ahmad Theater in Kuwait. The rhinoplasty faculty included Peter Adamson (Canada), Brajendra Baser (India), and Khaled Al-Sebeih (Kuwait). Dr. Foda gave 4 lectures on different rhinoplasty topics. Dr. Foda was an invited faculty at the 5th International Rhinology & Facial Plastic Congress held in Tehran. The Congress included a faculty of top rhinoplasty surgeons from Iran, USA, UK, Netherlands, Egypt, and Taiwan. Dr. Foda delivered 2 lectures and 2 instructional courses and shared in 2 panel discussions. Dr. Foda served on the organizing committee the European College of Aesthetic Medicine & Surgery (ECAMS) conference. Dr. Foda organized a Rhinoplasty masterclass that included 2 eminent speakers for the UK; Charles East and Rana Das-Gupta. Dr. Foda gave 2 lectures on the suturing techniques for nasal tip surgery and the pitfalls in nasal base narrowing. Dr. Foda was an invited faculty at the 2015 European Academy of Facial Plastic Surgery (EAFPS) conference. Dr. Foda gave 2 lectures on dorsal reduction and correction of the crooked noses and moderated a session on Ethnic rhinoplasty. Dr. Foda also served as a panelist on the revision rhinoplasty panel. Dr. Foda welcomed 4 visiting fellows from Germany, USA, and Jordan for a one-week live surgery fellowship which included daily lectures and intensive hands-on rhinoplasty training on 12 rhinoplasty cases; 8 primary and 4 revision cases that were carefully selected to include most of the functional and cosmetic nasal deformities. Dr. Foda was an invited faculty at the 8th International Congress of the Jordanian Society of Otolaryngology in Amman, Jordan. Dr. Foda gave 3 lectures on different rhinoplasty topics as well as an instructional course on revision rhinoplasty. Dr. Foda was an invited faculty at the Face-Eyes-Nose Conference held at University Hospitals Coventry and Warwickshire. Dr. Foda joined a Rhinoplasty faculty that included some elite Rhinoplasty Surgeons as Drs. Frame (UK), Patel (UK), Duron (France), Calvert (USA), Robotti (Italy), and Braccini (France). Dr. Foda gave 6 Rhinoplasty presentation and instructed the participants on different rhinoplasty techniques in the cadaveric dissection course. Dr. Foda was an invited faculty at the 9th Septorhinoplasty Course at Hospital De Cabuenes in Gijon, Asturias. The Course was elegantly organized by Dr. Federico Arrutia and Dr. Miguel Mancebo and included a faculty of top rhinoplasty surgeons from Puerto Rico, Portugal and Spain. Dr. Foda delivered 4 lectures covering different aspects of rhinoplasty and shared in 2 panel discussions as well as operated live on 2 Septorhinoplasty cases. Dr. Foda and Dr. Apaydin (Turkey) were the Directors of the Rhinoplasty workshop organized by the ENT Department at Dubai Hospital. Dr. Foda operated live on a case of septorhinoplasty for a crooked nose deformity and instructed the participants on different rhinoplasty techniques during the cadaveric dissection session. Dr. Foda and Dr. Fuleihan (Lebanon) were the Directors of the Rhinoplasty workshop organized by the Middle East Academy of Otolaryngology. Dr. Foda and Dr. Fuleihan lectured and instructed the participants on different rhinoplasty techniques during the cadaveric dissection session. Dr. Foda and Dr. Almeida (Brazil) were the main the International Guests at the 2nd Aesthetic & Functional Rhinoplasty Course that was organized by Dr. Nestor Galindo and Dr. Guillermo de Moreta at Hospital Ruber Internacional. Dr. Foda gave 7 Rhinoplasty lectures and operated live on a case with a deviated nose, dorsal hump, and overprojected tip. Dr. Foda was an invited guest faculty at the 4th Annual Meeting of Rhinoplasty Society of Europe. The faculty included esteemed rhinoplasty experts like Rick Davis (USA), Charles East (UK), Olivier Gerbault (France), Enrico Robotti (Italy), Julian Rowe-Jones (UK). The meeting was elegantly organized by Wolfgang Gubisch (Germany) and it was a memorable scientific and social event. Dr. Foda was an invited faculty at Ludwig-Maximilians-University’s Facial Plastic surgery Course where he gave a live surgical rhinoplasty demonstration. The Rhinoplasty session included lectures delivered by some top rhinoplasty surgeons like Dr. Berghaus the Course director and Dr. Perkins of Indianapolis. Dr. Foda shared in the Rhinoplasty session by 6 lectures covering different aspects of rhinoplasty and served as an instructor at the cadaveric dissection session. Dr. Foda and Dr. Apaydin (Turkey) were the main speakers, along with a group of elite rhinoplasty surgeons from the Gulf region, at the rhinoplasty sessions of the 5th Emirates Rhinology & Otology Congress. Dr. Foda delivered 3 talks on rhinoplasty in thick skin, correction of deviated noses, and nasal dorsum alignment. Dr. Foda welcomed 4 visiting fellows from Germany, Brussels, Jordan, and Libya for a one-week live surgery fellowship which included daily lectures and intensive hands-on rhinoplasty training on 12 rhinoplasty cases; 7 primary and 5 revision cases that were carefully selected to include most of the functional and cosmetic nasal deformities. Dr. Foda coached each of the fellows while performing the most delicate rhinoplasty maneuvers and techniques. DR FODA RHINOPLASTY COORDINATOR AT JOINT MEETING OF INTERNATIONAL SOCIETY OF INFECTION & ALLERGY OF NOSE (ISIAN) AND INTERNATIONAL RHINOLOGIC SOCIETY (IRS), DUBAI, UAE. Dr. Foda was in charge of the rhinoplasty program of the meeting that included 35 rhinoplasty speakers from 18 different Countries. The meeting include 8 full rhinoplasty sessions during which the speakers delivered more than 60 rhinoplasty presentations. Dr. Foda joined a faculty of distinguished German rhinoplasty surgeons including Wolfgang Gubisch, Werner Heppt, and Hans Behrbohm. This intensive symoosium was eleganty organized by Dr. Jacqueline Eichhorn-Sens. Dr. Foda Co-chaired the Rhinoplasty session with Herve Raspaldo (France). Dr. Foda also gave 2 Rhinoplasty lectures and an Instructional Rhinoplasty Course together with Enrico Robotti (Italy). The meeting was well attended by Rhinologists from Egypt as well as many other Arab Countries. Dr. Foda delivered a 1-hour instructional course on Revision Rhinoplasty. Dr. Foda, Dr. Wang (USA), and Dr. Robotti (Italy) joined the top Turkish Rhinoplasty surgeons for 3 days of intensive rhinoplasty sessions. Dr. Foda gave 2 Instructional Courses; on nasal tip surgery and on revision Rhinoplasty beside 4 other lectures on different Rhinoplasty topics. Dr. Foda welcomed 4 visiting fellows from Germay, Romania, Malaysia, and Jordan for a one-week live surgery fellowship which included daily lectures and intensive hands-on rhinoplasty training on 12 rhinoplasty cases; 6 primary and 6 revision cases that were carefully selected to include most of the functional and cosmetic nasal deformities. Dr. Foda coached each of the fellows while performing the most delicate rhinoplasty maneuvers and techniques. Dr. Foda joined a Faculty of elite Rhinoplasty surgeons from the USA, UK, Germany, and Turkey at the MERC 2014. Dr. Foda chaired 2 Rhinoplasty sessions and gave 6 lectures on different Rhinoplasty topics, as well as a Course on nasal tip surgery. Dr. Foda joined a huge Faculty of Rhinoplasty surgeons from all over Europe and the USA in an intense 3-day Rhinoplasty summit. Dr. Foda’s participation included 3 Rhinoplasty lectures, sharing in 2 Rhinoplasty panels, moderating the Revision Rhinoplasty panel, as well as performing one of the four Rhinoplasty Live surgical demonstrations presented. Dr. Foda joined a group of world-class Rhinoplasty experts including Dr. East (UK), Dr. Saban (France), Dr. Robotti (Italy), Dr. Kovacevic (Germany), Dr. Davis (USA), Dr. Gerbault (France), Dr. Goksel and Dr. Cakir (Turkey). The workshop included in-depth discussions of Rhinoplasty controversial issues, cadaveric dissections, and new power-tools examination. Dr. Foda joined the elite faculty of world leaders of open Rhinoplasty at the Bergamo 4th open Rhinoplasty course which was elegantly organized by Dr. Robotti and Dr. Mazzola with over 250 attendees from over 40 Countries. Dr. Foda gave a one-hour advanced masterclass on nasal tip projection & rotation. Additionally, Dr. Foda delivered 5 talks on different Rhinoplasty topics and shared in 3 Panels. Dr. Foda served on the faculty of the International Rhinoplasty Dissection Course which was organized by the Department of Otolaryngology at San Raffaele and facilitated by Dr. Mario Bussi. Dr. Foda, Dr. Palma (Italy), and Dr. Paun (UK) were the main speakers at the Rhinoplasty session of the Otolaryngology Conference organized by the Kuwaiti Ministry of Health. Dr. Foda presented four lectures covering the deviated nose, nasal dorsum, overprojected tip, and tip rotation. Dr. Foda, Dr. Wolf (Germany), and Dr. Tasca (Italy) were the speakers at the Rhinoplasty session of the 9th International Saudi ORL Conference which was held at Faisaliah Hotel, Riyadh. Dr. Foda gave three rhinoplasty talks covering the crooked nose, overprojected nasal tip, and nasal base narrowing. Dr. Foda gave 2 keynote lectures at the Rhinology Instruction Course organized by Prince Salman Bin Abdulaziz Hospital, Riyadh, Saudi Arabia. The topics of the lectures were Functional Rhinoplasty and Revision Rhinoplasty. Dr. Foda and Dr. Berghaus (Germany) were the Directors of the Rhinoplasty workshop organized by the ENT Department at Dubai Hospital. Dr. Foda operated live on a case of reduction rhinoplasty with nasal base narrowing and instructed the participants on different rhinoplasty techniques during the cadaveric dissection session. Dr. Foda, Dr. Berghaus (Germany), and Dr. Simmens (Swiss) were the main speakers at the Rhinoplasty session of the 4th Rhinology conference. Dr. Foda gave four rhinoplasty talks covering the crooked nose, nasal tip suturing techniques, and nasal dorsum alignment. Dr. Foda was the International guest speaker at King Fahad Hospital 1st Rhinoplasty Course. Dr. Foda gave 6 talks on different rhinoplasty topics as well as an hour of difficult case presentation for problem solving. Dr. Foda also shared in training the participants on different rhinoplasty maneuvers on fresh cadavers. Dr. Foda welcomed 4 visiting fellows; a Professor of Plastic Surgery from Switzerland and 3 ENT consultants from Romania, Russia, and Saudi Arabia, for a one-week live surgery fellowship which included daily lectures and intensive hands-on rhinoplasty training on 12 rhinoplasty cases; 6 primary and 6 revision cases that were carefully selected to include most of the functional and cosmetic nasal deformities. Dr. Foda coached each of the fellows while performing the most delicate rhinoplasty maneuvers and techniques. Dr. Foda was invited to give a live surgical demonstration of the open rhinoplasty on a case with a deviated nose. Dr. Foda also presented a keynote lecture on revision rhinoplasty at the rhinoplasty session which included a distinguished faculty of German rhinoplasty surgeons including T. Hundt, S. Holtmann, H. Gassner, A. Arlt, and W. Heppt. Dr. Foda chaired the rhinoplasty session which included eminent rhinoplasty speakers as G. Aiach (France), P. Palma (Italy), R. Das Gupta (UK), F. Braccini (France), and F. Riedel (Germany). Dr. Foda also lectured on revision tip surgery and gave a one-hour instructional course on new trends in rhinoplasty. Dr. Foda was invited to the 2nd meeting of Rhinoplasty Society of Europe at Istanbul, Turkey. Dr. Foda delivered a lecture on adjusting tip projection and rotation and attended the Rhinoplasty Society of Europe board of directors meeting. Dr. Foda was invited to the Istanbul advanced rhinoplasty course at Istanbul, Turkey. The Course included a lot of eminent Rhinoplasty surgeons and close friends as R. Daniel (USA), W. Gubisch (Germany), N. Cerkes (Turkey), E. Robotti (Italy), C. East (UK), O. Gerbault (France), and many others. In that meeting Dr. Foda gave 3 presentations about hump reduction, valve grafts, and base reduction. Dr. Foda also shared in a panel discussion on Secondary Rhinoplasty. Dr. Foda was invited to the 20th International Federation of Otorhinolaryngological Societies (IFOS) world congress in Seoul, Korea. This meeting which is held once every 4 years is considered the top international event in the specialty of Otolaryngology. In that meeting Dr. Foda lectured at the complications in rhinoplasty session and gave an Instructional course on revision rhinoplasty. Dr. Foda was invited to give 3 lectures at the 4th Asian Facial Plastic Surgery Society (AFPSS) meeting in Seoul, Korea. Professor Hong Ryul Jin did a great effort in bringing together a world-class faculty of facial plastic surgeons who shared their experiences over two full days. Dr. Foda was invited to lecture on how to avoid and manage revision rhinoplasty at the 10th Anniversary symposium of the nose inside and outside organized by the Seoul National University. The symposium included a distinguished faculty of national and international rhinoplasty surgeons. Dr. Foda was invited to give 2 pre-congress workshops; one on nasal tip surgery and another on revision rhinoplasty. Additionally, Dr. Foda delivered 5 lectures at the congress covering different rhinoplasty topics including the deviated nose, tip projection and rotation, open rhinoplasty in thick nasal skin, and revision tip surgery. Dr. Foda welcomed 5 visiting fellows; 2 Consultants from England, 2 Professors from Italy, and a Consultant from Saudi Arabia, for a one week live surgery rhinoplasty fellowship which included daily lectures and intensive hands-on rhinoplasty training on 12 rhinoplasty cases; 6 primary and 6 revision cases that were carefully selected to include most of the functional and cosmetic nasal deformities. Dr Foda coached each of the fellows while performing the most delicate rhinoplasty maneuvers and techniques. Dr. Foda was an invited faculty at Ludwig-Maximilians-University’s Facial Plastic surgery Course where he gave a live surgical rhinoplasty demonstration. The Rhinoplasty session included lectures delivered by some top rhinoplasty surgeons including Dr. Romo (New York, USA), Dr. Anari (Birmingham, UK), and Dr. Berghaus the Course director. Dr. Foda shared in the Rhinoplasty session by 4 lectures covering different aspects of rhinoplasty and served as an instructor at the cadaveric dissection session. Dr. Foda and Dr. Gubisch (Germany) were the Directors of the Rhinoplasty workshop organized by the ENT Department at Dubai Hospital. Dr. Foda operated live on a case of revision rhinoplasty with ear cartilage grafts and instructed the participants on different rhinoplasty techniques during the cadaveric dissection session. Dr. Foda and Dr. Gubisch (Germany) were the main speakers at the Rhinoplasty session of the 3rd Rhinology conference. Dr. Foda gave three rhinoplasty talks covering the crooked nose, nasal tip suturing techniques, and revision tip surgery. Dr. Foda joined a distinguished group of invited international speakers and gave three talks on Rhinoplasty discussing the crooked nose, septal perforations, and nasal tip surgery. The conference was perfectly organized and attended by a massive number of Otolaryngologists from all over India as well as from neighboring Countries. DR FODA INVITED SPEAKER AT THE 3rd INTERNATIONAL RHINOLOGY CONFERENCE, RIYADH, SAUDI ARABIA Dr. Foda gave four talks in the Rhinoplasty session discussing the crooked nose, septal perforations, dorsal alignment, and revision tip surgery. The conference was gracefully organized by Prince Salman Bin Abdulaziz Hospital and was very well attended. Dr. Foda gave a one-hour instructional course on rhinoplasty and Co-chaired a rhinoplasty session, titled new trends in rhinoplasty, with Dr. Enrico Robotti (Italy). Dr. Foda also lectured on revision rhinoplasty at a second rhinoplasty session with 3 renowned rhinoplasty surgeons; Dr. Rowe-Jones (UK), Dr. Apaydin (Turkey), and Dr. Braccini (France). Dr. Foda joined a distinguished faculty of German and International Aesthetic surgeons at the meeting in Freiburg. Dr. Foda Co-chaired the Rhinoplasty session with Dr. Thomas Hunt and lectured on nasal tip surgery and on the external rhinoplasty approach. Dr. Foda joined a distinguished faculty of Russian & Ukraine rhinoplasty surgeons and gave 4 rhinoplasty lectures that discussed the revision tip surgery, deviated noses, droopy tip, and thick nasal skin, and served as a panelist in 2 revision rhinoplasty panels. Dr. Foda also operated live on a case with cleftlip nasal deformity that had 3 unsuccessful previous rhinoplasties. Dr. Foda gave 5 rhinoplasty lectures that discussed the droopy tip, overprojected tip, crooked noses, thick nasal skin, and the perioperative care of rhinoplasty patient. Dr. Foda also shared in a round table discussion on revision rhinoplasty with a group of Brazil’s best rhinoplasty surgeons. Dr. Foda joined an elite faculty of Jordanian rhinoplasty surgeons including Dr. Shubailat, Dr. Alkarmi, Dr. Jarrar, Dr. Bataineh, and Dr. Dawood. Seven lectures were given by Dr. Foda covering different rhinoplasty topics as well as an interactive rhinoplasty video presentation. The symposium was perfectly organized by the executive board of the JSPRS headed by Dr. Mahmoud Wreikat, Dr. Khaldoun Haddadin, and Dr. Kusai Elmusa. Dr. Foda was invited to join the largest faculty of facial plastic surgery leaders in Rome. Dr. Foda was invited to lecture on restructuring the nasal tip support and on rhinoplasty in thick nasal skin. Dr. Foda joined a faculty of premier rhinoplasty surgeons including Dr. Wang (USA), Dr. Robotti (Italy), Dr. Haraldsson (Sweden), Apaydin (Turkey), and Dr. Kassir (USA). The Congress was perfectly organized by Dr. Naraghi and attended by a huge number of dedicated participants. Dr. Foda’s participation included 5 talks on different rhinoplasty topics, instructional course on tip surgery techniques, and a rhinoplasty video session. A highlight of the Congress was a live surgical demonstration by Dr. Foda on a revision rhinoplasty case. Dr. Foda was invited to be a founding member of the Rhinoplasty Society of Europe. At the founding congress of the society Dr. Foda gave a lecture on nasal base narrowing and chaired the Nasal tip surgery session together with Dr. Heppt. Dr. Foda organized a rhinoplasty session at the 29th Alexandria International Combined ORL Congress. The speakers in the session included Dr. Berghaus from Germany, Dr. El-Guindy, Dr. Farouk, and Dr. Foda from Egypt. The session covered a wide range of rhinoplasty topics as nasal aesthetics, rhinoplasty approaches, tip surgery, and the deviated nose. Dr. Foda welcomed 5 visiting fellows from Romania and Jordan for a one week live surgery rhinoplasty fellowship which included daily lectures and intensive hands-on rhinoplasty training on 12 rhinoplasty cases; 6 primary and 6 revision cases that were vigilantly selected to include most of the functional and cosmetic nasal deformities. Dr Foda coached each of the fellows while performing the most delicate rhinoplasty maneuvers and techniques. Dr. Foda joined a faculty composed of world leaders of open rhinoplasty including Dr. Aiach of Paris, Dr. Daniel of Newport Beach, Dr. Gubisch of Stuttgart, Dr. Calvert of Beverly Hills, Dr. Cerkes of Istanbul, Dr. East of London. It was one of the most intensive rhinoplasty courses expertly organized by Dr. Enrico Robotti & Riccardo Mazzola, it including over 200 attendees from 40 Countries. Dr. Foda gave a one-hour advanced course on revision rhinoplasty along with 5 rhinoplasty lectures and 3 rhinoplasty panel discussions. Dr. Foda was an invited visiting Professor at Ludwig-Maximilian-University’s Facial Plastic Surgery Course where he gave a live surgical rhinoplasty demonstration. The Rhinoplasty session included lectures delivered by some premier rhinoplasty surgeons as Dr. Adamson (Toronto, Canada), Dr. Anari (Birmingham, UK), and Dr. Berghaus the Course director. Dr. Foda shared in the Rhinoplasty session by 4 lectures covering different aspects of rhinoplasty and shared as an instructor in the rhinoplasty cadaveric dissection sessions. At the ICAAM in Dubai, Dr. Foda was invited to chair the rhinoplasty session with Dr. Braccini of France. Dr. Foda delivered a keynote lecture on revision rhinoplasty and another talk on the aging nose. Dr. Foda was an invited guest lecturer at the 2nd International Conference of the Jordanian Society of Plastic & Reconstructive Surgeons. Dr. Foda presented 3 Rhinoplasty lectures on the crooked noses, revision noses, and nasal tip surgery. Dr. Foda was an invited guest lecturer at the 34th Annual Meeting of the European Academy of Facial Plastic Surgery. In recognition of Dr. Foda’s vast experience in Revision Rhinoplasty; the Academy selected Dr. Foda, for the 3rd year in a row, to give the revision rhinoplasty instructional course. Dr. Foda’s contribution included other lectures and workshops including nasal tip surgery, the wide nasal base, and pitfalls in reduction rhinoplasty. Dr. Foda was an invited guest lecturer at the 16th Annual Meeting of the Lebanese Society of Otolaryngology H&N surgery. Dr. Foda joined by Dr. Fazil Apaydin, a leading rhinoplasty surgeon from Turkey, covered all aspects of functional and cosmetic rhinoplasty starting from basic principles to cutting-edge advances. Dr. Foda was an invited guest lecturer at the 6th International Congress of the Jordanian Society of Otolaryngology H&N Surgery. Dr. Foda presented 5 lectures covering different aspects of rhinoplasty including tip surgery, crooked noses, thick nasal skin, and functional aspects in rhinoplasty. Dr. Foda was the invited international guest of the Facial Plastic Surgery Week at UCL Ear Institute. This meeting was organized by Dr. Charles East who succeeded in bringing together all the leading rhinoplasty surgeons of the UK. Dr. Foda operated live performing a septorhinoplasty on a case with a hump and a crooked nose and septum. Additionally, Dr. Foda presented 5 rhinoplasty talks including a keynote lecture titled “Rhinoplasty: a personal approach”, the other keynote lecture was delivered by UK’s rhinoplasty pioneer Mr. Tony Bull. Dr. Foda also shared in the rhinoplasty panel discussions and difficult case presentations. This is the 12th Annual International Rhinoplasty Course that Dr. Foda organizes at Alexandria Medical School. Our international guests this year were Prof. Peter Adamson from Canada and Prof. Wolfgang Gubisch from Germany both world renown leaders in rhinoplasty shared their vast experience with the participants who came from 15 Countries. A full-day of interactive video sessions was the highlight of the Course. Dr. Foda was an invited guest lecturer at the 7th Pan Arab & 8th Saudi International ORL-HN Surgery Conference. Dr. Foda gave 6 rhinoplasty lectures covering a wide range of topics including tip surgery, crooked noses, grafting, secondary rhinoplasty, septal perforations, and nasal base reduction. Dr. Foda also shared his expertise with colleagues in the rhinoplasty panel discussions. 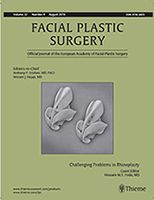 Dr. Foda’s new nasal base reduction technique; the Boomerang-shaped excision, was published in the current issue of Facial Plastic Surgery the official Journal of the European Academy of Facial Plastic Surgery. Dr. Foda was an invited visiting Professor at Ludwig-Maximilian-University in Munich. Dr. Foda gave a live surgical demonstration of his Rhinoplasty technique and Dr. Richard Gentile, a premier facial plastic surgeon from Ohio, demonstrated his laser-assisted face-lifting technique. Dr. Alexander Berghaus the Chairman of the Course and the Department operated on an Otoplasty case. Dr. Foda presented 4 Rhinoplasty lectures and shared as an instructor in the Rhinoplasty cadaveric dissection session. Dr. Foda was an invited guest lecturer at the 7th Tanta International Meeting on Advanced Otolaryngology. In the Rhinoplasty session, Dr. Foda lectured on the new advances in nasal tip surgery and Dr. Fazil Apaydin, from Turkey, covered other interesting rhinoplasty topics. Dr. Foda was invited to organize and chair the Rhinoplasty session at the 1st Emirates International Rhinology Conference which took place in Dubai on Jan. 12-14, 2011. Dr. Foda succeeded in bringing together leading rhinoplasty surgeons from different Arab Countries including Egypt, Saudi, Lebanon, Emirates, and Jordan.